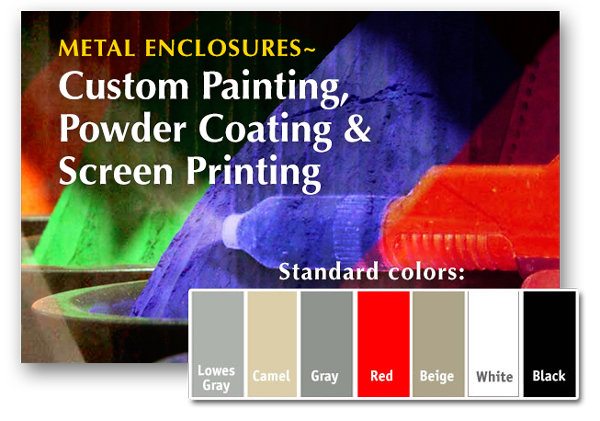 Powder coatings & graphic screen printing for a durable, attractive finish. 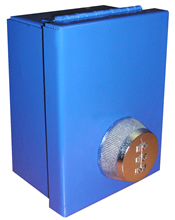 We want to make sure your metal enclosures make the statement you or your customer want. You may choose from just about any color you can think of, or save a little money by choosing one of the standard colors shown above. Regardless of what color you choose for your finish, consider the final product: Will your enclosure be used inside or outside? We will paint your utility boxes accordingly. 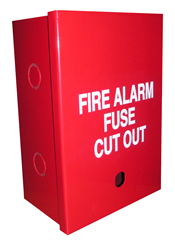 Will your application be in an office environment where your custom painted metal boxes should blend in with the surroundings? Will it be in a hospital where it should match all of the other white instruments or walls, or will it be a safety item that needs to be easily seen? If you have questions, just let us know what your application is and we will be happy to give suggestions. Graphic screening is the perfect way to make your company logo stand out, make sure specific instructions are seen or to identify what’s inside the enclosure. When deciding on graphics make sure the colors work well with the color of the enclosure, especially if you really need the graphics to make a statement. We are able to screen as many colors as you want, but keep in mind each color adds costs. Most companies use a one or two-color logo, with any additional information matching one of those two colors. You also want to make sure the graphic is not something that will change often. Set-up costs are incurred anytime the artwork and screens need to be redone. One of our customers knew he was moving his business, so he included his website and phone number instead of his postal address. Powder coating is the paint coverage of choice for Mier enclosures because it provides an attractive, scratch-resistant paint finish that has great durability. Powder coating is also more economical as it comes in a variety of eye-catching colors and provides longer paint life for 1/10th the cost of conventional painting. It’s environmentally friendly too. There are no EPA hazardous waste issues. Mier’s powder coaters have the experience, knowledge and desire to fulfill coating requirements. They are dedicated to quality and customer service, and have more than 180 combined years of experience. This translates to efficient and high-quality processes, which save you money. The final application of the enclosure — outside or inside — plays an important part in the process. 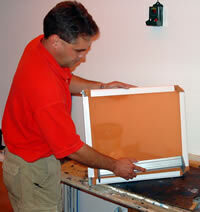 Make certain you tell the Mier designer where your enclosure will be installed. 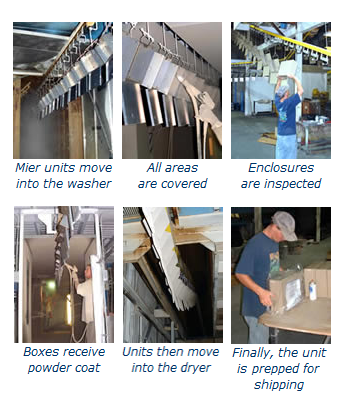 Mier’s powder coaters use a four-step system that incorporates a four-stage washer, a drying oven, powder coating and a cure oven. A 650-foot continuous conveyor ties the steps together as it moves Mier’s enclosures through the process at 7 1/2-feet per minute. The four-stage wash process prepares the enclosures for painting and provides corrosion protection. In the first wash stage, the enclosure is given a detergent iron phosphate bath that removes grease and oil, and deposits iron phosphate crystals on the metal. The enclosure is then rinsed with fresh water and rinsed again with slightly acidic water that eliminates water-spot buildup in the fourth stage, de-ionized water is used to clean and prepare the enclosure for coating. The enclosure then passes through a drying oven. After drying is complete, the powder coating is applied with corona guns. The guns create a corona or halo of charged particles at the point of application. This assures a long-lasting, even bond to the metal surface. 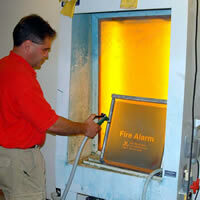 After painting, the enclosure moves into the 350-degree cure oven for 15 minutes. The enclosure then cools as it is conveyed to the inspection and packing area. A powder coated finish is just another example of Mier’s commitment to quality without compromise. Mier units move into the washer. Boxes receive a powder coat. Units then move into the dryer. Approved, the unit is prepped for shipping. Generally referred to as “silk-screening,” direct printing offers a colorful, professional and eye-catching way to make your Mier enclosure unique or to highlight your company logo. Unlike a decal, a direct print logo adds value to your Mier enclosure because it’s permanent. It won’t peel or wear off. 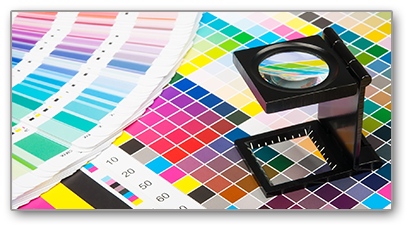 The quality of printing depends on people and equipment, and Mier has available some of the most experienced people and the best equipment in the direct printing business. 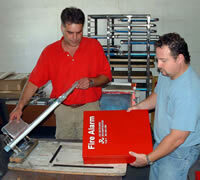 Quality direct printing starts with the artwork, and the artist, who will set up your artwork is one of the best. He has more than 35 years of experience. He can take supplied artwork or create an image from a customer’s idea and produce a detailed film positive. The printer and his staff also have a lot of experience. Their combined experience in the trade totals more than 50 years. As stated, equipment and material are also very important and Mier’s direct printer use the “Cadillacs” of the industry. After a screen is created with the artwork, it is lined up with the enclosure and locked in place. Ink is poured on the screen and pressed through the image area on the screen. As the ink passes through the screen, your design is “printed” on the enclosure. A different screen must be created and used for each color printed. Each color is screened separately with drying time in-between screening. 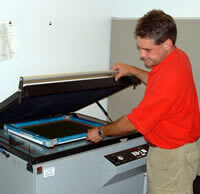 The experienced direct printer and his staff know how much tension and ink to apply to a screen. Such knowledge produces an image with sharp, well-defined edges and smooth, uniform color that appears on Mier metal enclosures. Contact Mier for more information about our silk-screening and powder coating procedure – or browse through the site to learn about our other quality products. Emulsion is placed on the screen. Exposure unit burns image on screen Emulsion is placed on the screen. Emulsion is washed off revealing image. Ink is applied and then dried.